Esteki, M.; Mejuto, J.C.; Simal-Gándara, J. Deliberate adulteration of food products is as old as food processing and production systems. Food adulteration is occurring increasingly often today. With globalization and complex distribution systems, adulteration may have a far-reaching impact and even adverse consequences on well-being. The means of the international community to confront and solve food fraud today are scattered and largely ineffective. A collective approach is needed to identify all stakeholders in the food supply chain, certify and qualify them, exclude those failing to meet applicable standards, and track food in a real time. We discuss a wide range of the currently available technologies for detecting food adulteration. Figure 1. FT-IR spectra for turmeric powder (Curcuma longa L.) containing different amounts of Metanil Yellow as adulterant. Reproduced from Dhakal et al. (2016) , licensed under CC BY-4.0. Spectroscopies (MIR, NIR, Raman, NMR, UV–VIS). Separation techniques (GC, HPLC, electrophoresis). Fingerprinting chromatography technology is perfectly suitable for food authentication in-house. When method transferability is needed for acceptance by authorities, producers and consumers, food reference materials should be used to normalize fingerprinting signals across equipment. Compositional information on significant chemical markers may be subsequently used to confirm authenticity and assure transferability. Chromatographic fingerprinting in combination with chemometric techniques is a powerful tool for detecting food fraud. There are other useful technologies for fraud detection including electronic noses and tongues, nanosensors, thin-film sensors and nanoparticle detection systems. In this era of collaboration among the life, engineering and physical sciences, novel developments will continue to tackle those negatively interfering with our food systems for whatever purpose. A pan-European effort was conducted to develop generic procedures for food tracing and verification. The aim is to link key parameters of food with those of local environments. By studying climate and geology, scientists expect to be able to predict the parameter profiles to be expected from foods of a given provenance. It will then be relatively easy to check whether the actual profile of a food matches the predicted profile. Together with food mapping, spectroscopic and biological fingerprinting methods are expected to facilitate food verification. The increasing power of data acquisition and interpretation techniques has allowed atypical samples to be identified; also, it may facilitate the development of food verification systems affording a forensic approach to food authentication. Figure 2. Scatter plot for the PLS–DA model as constructed from 52 authentic saffron (Crocus sativus L.) samples differing in geographic origin, harvest year and storage conditions (“fresh”: 0–4 years of storage; “non-fresh”: 7–12 years of storage). Blue, green and white dots represent “fresh”, “non-fresh” and the 17 commercial samples of unknown storage history, respectively. Reproduced from Consonni et al. (2016) , licensed under CC BY-4.0. A fingerprinting method uses the data contained in a highly specific feature or fingerprint (mass spectrum, IR spectrum, etc.) to understand the properties of the target system. Several statistical techniques can be used to reduce the dimensions of data, thus allowing significant information to be extracted from a complex dataset. Such techniques allow revealing complex relationships among samples and detecting characteristic patterns that can be used to identify a certain group. This is the task of unsupervised pattern recognition techniques such as hierarchical cluster analysis (HCA), cluster analysis (CA) and principal component analysis (PCA) , which require no prior knowledge of the sample properties. PCA is the most used among these tools. A PCA model allows complex data to be projected into a lower-dimensional space by using orthogonal combinations of the variables, termed as “principal components” (PCs). Thus, PCs determine a reduced space to extract the most important information from the data. PCA also allows finding relationships in the data matrix by analysing the structure of the observations and the variables. Multivariate methods can be also used to categorize a particular product or to quantify any of its properties. Based on the information previously acquired from a training set, classification models allow identifying to which category a new sample belongs. This models can be used, for instance, to authenticate organic products  or geographic origin . Supervised pattern recognition techniques including soft independent modelling of class analogy (SIMCA), k-nearest neighbours (kNN), partial least squares regression discriminant analysis (PLS-DA), linear discriminant analysis (LDA), support vector machine (SVM) and artificial neural networks (ANN) have been used in this context. Regression models establish a relationship between a quantitative sample parameter (the dependent variable) and multiple independent variables such as chromatographic peaks, absorption bands, etc., which can be used to estimate the value of that parameter in a new sample. Different kinds of regression models can be used to detect fraudulent samples, including linear regression models using multivariate regression techniques such as principal component regression (PCR) and partial-least square regression (PLSR), together with non-linear models based on support vector machine methodology (SVM) and artificial neural networks (ANN), have been used. A problem in this context is the absence of internationally accepted procedures for assessing methods based on fingerprinting techniques and classification models. Nutrition and Bromatology Group, Department of Analytical and Food Chemistry, Food Science and Technology Faculty, University of Vigo – Ourense Campus, E-32004 Ourense, Spain. ([email protected]); corresponding author. 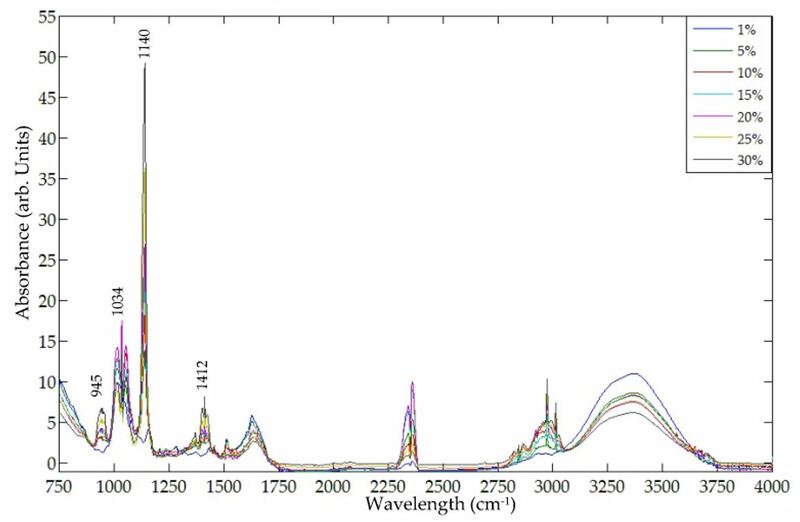 Sagar Dhakal; Kuanglin Chao; Walter Schmidt; Jianwei Qin; Moon Kim; Diane Chan; Evaluation of Turmeric Powder Adulterated with Metanil Yellow Using FT-Raman and FT-IR Spectroscopy. Foods 2016, 5, 36, 10.3390/foods5020036. Luis Cuadros-Rodríguez; Cristina Ruiz-Samblás; Lucía Valverde-Som; Estefanía Pérez-Castaño; Antonio González-Casado; Chromatographic fingerprinting: an innovative approach for food 'identitation' and food authentication – A Tutorial. Analytica Chimica Acta 1970, 909, 9-23, 10.1016/j.aca.2015.12.042. David I. Ellis; Victoria L. Brewster; Warwick B. Dunn; J. William Allwood; Alexander Golovanov; Royston Goodacre; Fingerprinting food: current technologies for the detection of food adulteration and contamination. Chemical Society Reviews 2012, 41, 5706, 10.1039/c2cs35138b. Roberto Consonni; Stella A. Ordoudi; Laura R. Cagliani; Maria Tsiangali; Maria Z. Tsimidou; On the Traceability of Commercial Saffron Samples Using 1H-NMR and FT-IR Metabolomics. Molecules 2016, 21, 286, 10.3390/molecules21030286. Worley, B., & Powers, R. (2013). 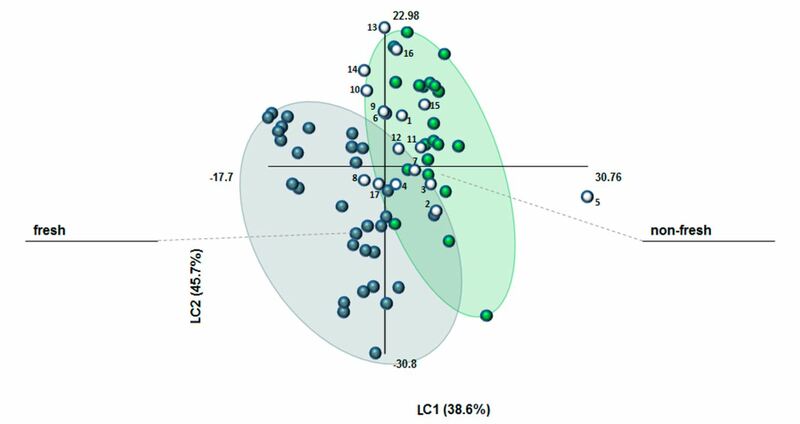 Multivariate Analysis in Metabolomics. Current Metabolomics, 1(1), 92–107. Edoardo Capuano; Saskia M. Van Ruth; QA: Fraud Control for Foods and Other Biomaterials by Product Fingerprinting. Latest Research into Quality Control 2016, 21, 286, 10.5772/51109. Pei Wang; Zhiguo Yu; Species authentication and geographical origin discrimination of herbal medicines by near infrared spectroscopy: A review. Journal of Pharmaceutical Analysis 2015, 5, 277-284, 10.1016/j.jpha.2015.04.001. Forensic chemistry food fingerprinting fraudulent ingredients food fraud food chain integrity.